As you guys already know, I’m headed to Switzerland in exactly two weeks! I’ve never been before, so you can imagine how excited I am. I’ll be staying in Zurich, Bern and Geneva and taking day trips from each of those cities! So many of the trips I take are in bustling cities (which I love), but I’m looking forward to getting outside and really enjoying the crisp air and scenery on this trip. I’ll be going on a few different hikes throughout my trip to experience the best of Switzerland summers, so earlier this week I made a few purchases to make my hikes a little easier. First, I ordered a few different pairs of hiking boots to try. I ordered this pair, this pair and this pair, and will be returning the two that don’t work. I’ve been told I need to break them in before I hike, so looks like I’ll be walking around my house in hiking boots for the next two weeks! I also purchased some wool socks and this backpack, which features a special back-zip section for my DSLR camera. I’ll also be keeping other important things like a copy of my passport and money in that section, since you can’t get to it unless I take the backpack off. Such a genius idea! Per your suggestions on Instagram, I also ordered these Nuun tablets, this compact first aid kit, this whistle, a LifeStraw, collapsible trekking poles, sanitizing wipes and a flashlight. 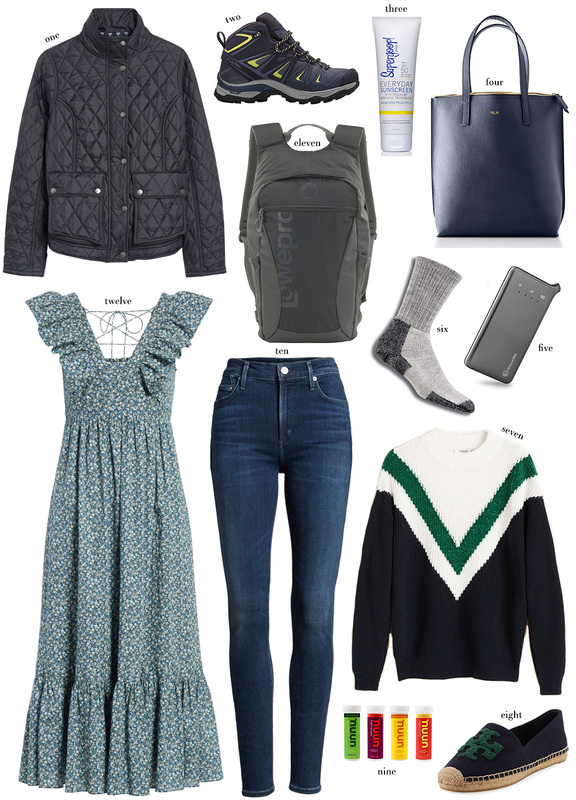 I want to keep my backpack as light as possible, but also want to make sure I have some necessities in case I find myself in a tricky situation! The trails I’ll be doing are of easy to moderate difficulty so I don’t imagine I’ll have any issues, but better safe than sorry. Luckily all the items I purchased are teeny tiny (did you catch my InstaStories yesterday? ), so hopefully my backpack will still have plenty of room for the most important thing: SNACKS! Also, I felt sort of silly buying all of this stuff for one trip… that is until I realized I’ll also be hiking in Colorado when I go to Vail in September! Looks like I’ll be getting some good use out of this stuff right off the bat. Switzerland is my favorite! You are going to have so much fun and this is the best time of year to go. Can’t wait to follow along!! Omg so excited to follow along ! And I really love that dress! Is there somewhere nearby outside where you could take your hiking boots on a short jaunt, about 2 miles? It will help you see how you feel in them on uneven terrain and help to break them in. I love hiking on vacation. It is such a great way to see the country or state as it might have been years (or centuries) before. Wow this is very helpful and so timely. I too am leaving for Switzerland in two weeks! My first time. I’m sure we’ll both have an amazing time. Great post! Do you have a favorite travel dual voltage hair dryer that you use in Europe? I’m in the market for one as I’m moving to Germany in a few months. I want a travel one because we will be “homeless” for the two months prior to moving overseas. Merritt, I’m hiking in the Dolomites right now. I looked at the Saloman’s but ended up with Lowa’s because of the support. Make sure you have room for rain gear. I have the Patagonia Torrentshell jacket. I got some carabiners from Rei to attach things to my backpack. Try to practice with trekking poles before you go. I hiked 7 miles through the mountains and they saved me. Are you going with a tour? It’s really hot currently. I highly recommend Lowa boots – so comfy and don’t need any breaking in! I think mine are the Lowa Renegade GTX mid hiking boot in graphite/jade and don’t look too awful (found your stories so funny about how ugly hiking boots are – totally agree!!). I got them recently for a trip to Iceland that I didn’t have much time to plan for so bought them just a few days before leaving and never had to break them in! If you’ve never been to Iceland highly recommend it!! I was blown away by the beauty of the land!! So hopefully you’ll make it there one day soon and have another excuse to use your hiking gear! Btw if you ever go to Iceland I recommend rain pants and cozy long underwear for underneath. No matter time of year it’s always rainy and cold there! But gorgeous! I may be going to Switzerland this fall as well – last time I was there was 20 years ago during college when I stayed in beautiful interlaken and did some hikes around there. Can’t wait to see what you have planned!